Summer months bring warm weather, seasonal dining deals. Chop Bar's whole roasted pig is a bit more exciting than burgers on a grill. It's one of those lazy, unspeakably beautiful Sunday afternoons in Oakland, and the crowd that's formed outside of Chop Bar (247 4th St., 834-2467, oaklandchopbar.com) has all the makings of a neighborhood block party: Short sleeves and flip-flops. Little kids bouncing around. The exchange of fist bumps. The knocking back of cold beer. And a cause for real celebration: not one but two pigs, butterflied and roasted whole, each one a veritable marvel of crackling skin and fatty, tender flesh. It's a party all right — one that, weather permitting, Chop Bar owners Chris Pastena and Lev Delany will be hosting the third Sunday of every month, from now through November. And, much to the delight of East Bay epicures, the pig roast is just one of several fun and reasonably priced special dinners that will grace the local restaurant scene this summer. 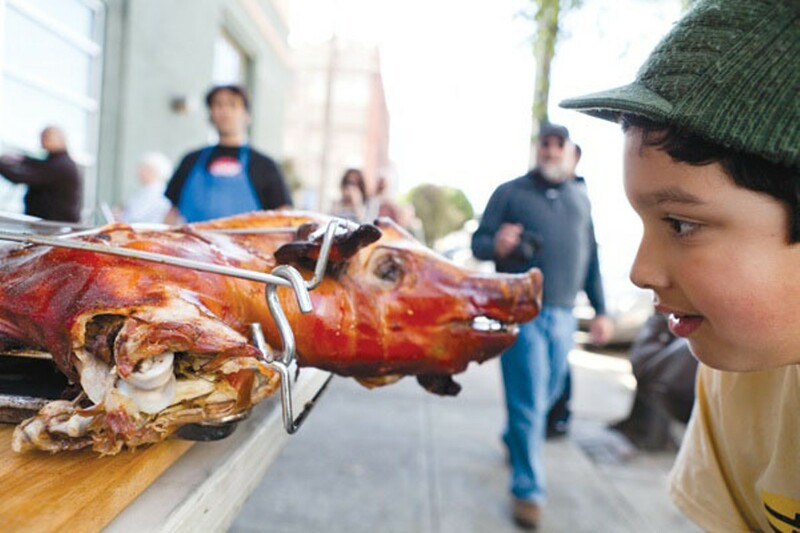 Pastena says the idea for doing the pig roast grew out of the realization that there were all these apartment buildings in the immediate vicinity of their restaurant, located a few blocks from Jack London Square. "So there are no backyards, and there are no places where people can come and hang out in the neighborhood," he explained. "So this is kind of the backyard barbecue for everybody who lives in the lofts and all the apartments." And not just any barbecue. After all, a whole roasted pig — snout, tail, and all — is quite a bit more exciting than burgers and wieners on a grill. As Delany puts it, "It creates a sense of an event when you march the pig out. There's a little bit of theater to it." For Chop Bar, roast pig has been a signature item ever since the proprietors dished it out at the first Eat Real Festival in 2009, weeks before opening their brick-and-mortar restaurant. By now, Delany, who takes the lead on pig preparation, has it down to a science. They get the pigs from nearby J & M Meat — a couple of 70-plus-pounders for their recent April roast — and then brine them in a mix of salt, vinegar, dried chilies, and other spices. Delany explains that the actual roasting technique takes a good four or five hours and, like so many good things, may have been invented by the Chinese. As the story (probably apocryphal) goes, some Cuban nationals in South Florida or somewhere saw Chinese laborers roasting pigs in these wooden boxes and decided to copy the method, dubbing the box "la caja china" ("the Chinese box"). Whatever the case may be, anyone can go online now and buy these big wooden boxes. You stick the pig inside, light some charcoal on top, and then it's just a waiting game. Delany says this is the easiest, most reliable method he's found for getting the pig's skin nice and crisp, the meat juicy and tender. In any case, twenty bucks, paid in advance at a ticket window, will buy you a good amount of porky goodness, assuming you have the patience to go through the line a couple times. "We don't want to say 'all you can eat' because we're not going to guarantee that. When it's gone, it's gone," Delany said. "But the way it usually works out is everyone who wants seconds gets seconds." According to Pastena, it only takes about 45 minutes for an entire pig to get served up and devoured. Regulars know to request the choicest parts when they get to the front of the line: the cheek, the belly, the back of the neck. Someone will always ask for the ears. Someone will always ask for the tail. Meanwhile, the spread of seasonal side dishes and sauces and salsas is just as impressive. The April menu included, among other offerings, grilled asparagus, German-style potato salad, corn bread, a Hoisin barbecue sauce, and at least two different kinds of salsa. Everything is made from scratch in-house. As mentioned, Chop Bar's pig roasts take place the third Sunday every month, but it's prudent to call ahead (and check the weather forecast) to make sure it's on. Fortunately, Pastena says, "It never rains on the pig roast. We don't allow it to rain." No one ever thinks about trekking out to the Oakland Hills when making weekend dinner plans, but, this summer anyway, you should. By day, Woodminster Cafe (5020 Woodminster Lane, 530-1661) serves up a typical array of solidly-prepared deli food: The homemade scones and the garlicky chicken salad are quite good, and the hamburgers have a sparkling reputation. But on Friday nights during the summer months, Siavash Payrovi — "Sia," as all the regulars call him — and his family serve up home-cooked Persian food at astonishingly reasonable prices. And it is spectacular. The vinegary Salad Shirazi ($4.95) is exactly the kind of bright-tasting, refreshing salad you crave in warm weather. It's a deceptively simple blend of cucumber, tomato, and red onion, everything diced just so. The slow-cooked lamb shank ($13.95) is about as falling-off-the-bone tender as it gets. And the lamb kabob ($12.95) is flavorful and moist — the result, Payrovi says, of using all lamb (not a mixture with beef) and of the somewhat unorthodox addition of onion juices to the meat. Everything's served over a heaping mound of fragrant saffron rice. Payrovi says he started the Friday night dinners about five years ago, confident that his food was better — and a better deal — than the other Persian options in the area: "These prices, you can't get them. For my portions, for my food? No way." The most popular items on the Persian dinner menu are the lamb stews ($12.95). Each week Payrovi alternates between the green, parsley-based Ghormeh Sabzi and a red stew called Gheimeh Bademjan that features eggplant and crispy potatoes. The stews almost always sell out, so Payrovi suggests that customers call him a day in advance so that he knows to save them an order. A recent dinner featured the Ghormeh Sabzi, a labor-intensive dish that Payrovi says is always served during formal dinner parties in his native Iran. The stew is delicious — intensely fragrant with a certain healthful, almost medicinal quality to it that the Chinese call "bu." In a way it's reminiscent of a bowl of good Chinese herbal chicken soup. Payrovi says he puts parsley, shambalileh (fenugreek leaves), dried lemon, onions, and red beans in the stew. As far as any health benefits eating it might provide? "Everybody knows that Persian food is very healthy food," he said. The Friday night Persian dinners at Woodminster Cafe go from 5:00 p.m. until 7:30 p.m., or until the food runs out. Finally, as far as pure bang for buck is concerned, it's tough to beat the Sunday Suppers that Old Oakland's B Restaurant & Bar (499 9th St., 251-8770, boakland.com) has been hosting during the summer for the past couple of years. For a mere $20 per person (though this year's prices haven't been definitively set) you get an entire prix-fixe meal, served family style — and as many second or third helpings as you'd like. Just ask nicely. Past offerings have included a braised lamb shoulder, served with carrots and potato purée and a killer gnocchi, and another whole dinner that focused on heirloom tomatoes. This year B is keeping it simple. The dinners, to be held on the last Sunday of each month through September, will alternate between fried chicken and whole pig. Side dishes and desserts for each month's menu will be determined as it gets closer to the date — the first Sunday Supper, a fried chicken dinner, will take place on June 26. Reservations are a good idea. Guilty Treasures The World's Best Seeds?